So I dove right into Madam Secretary and I totally loved it. It felt like a sort of higher view of the same material tackled by shows like Homeland. Thus it's less on the front lines sort of action and more looking at the larger geopolitical picture. And that really works for me for some reason. The second season of Madam Secretary continues on building this story and expands on it with timely real-world references, more intrigue and some major power shifts in the global arena of the show. And how they balance things out to keep the story going is a big part of the brilliance of this show. For the most part Russia is the big focus of this season and in a very interesting way. Such shifts in power can have a number of implications for the counttry and the world at large and this season nicely explores a number of those nuances. It's not like everyone can ensure the security of the free world while raising a family, right? Synopsis: Madam Secretary is an American political drama series created by Barbara Hall with executive producers Lori McCreary and Morgan Freeman. The show is already in its fourth season as of the time of this blog post. 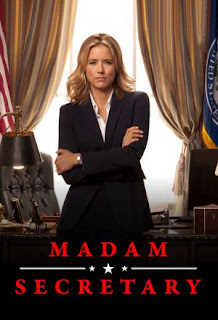 The season begins with a startling moment - a possible emergency that requires Secretary of State Elizabeth McCord (Téa Leoni) to be sworn in as acting President of the United States as the location of Air Force One is temporarily unknown. If anything the moment certainly makes her think about the weight of power that comes with the Office. This season also includes a rather major arc involving the death of Russian President Ostrov (Olek Krupa) and the whole question of the control of that country. On the home front Stevie (Wallis Currie-Wood) continues to make poor relationship decisions. Alison is thinking about her college options, which evenually becomes a bit of a family concern. And more and more it seems that Henry McCord (Tim Daly) has more and more value to the government as more than just a consultant. What I Liked: The Russian story arc and how the country gets put back together is a brilliant one and it's a story that has a lot of great surprises across the many episodes it covers. It's big time political maneuvering at its finest and it's a heck of a lot of fun. But the sublter, bigger arc for the season involved the cyber attack on Air Force One that kicked things off that resulted in a bit of a spotlight on the dangers of digital warfare. The fact that it was such a slow burn issue that had to be parked for some time and only revisited many episodes later made the payoff even more fulfilling. I'll admit that I was also pretty invested in the Dmitri (Chris Petrovski) storyline asit goes from him being one of Henry's students to becoming recruited to act as a spy for the United States. His story naturally connected to the Ostrov story but somehow ran parallel to it as Henry was given more of a recurring B-side plot apart from the big stuff with Elizabeth. And I really enjoyed the shift back and forth for the two. What Could Have Been Better: The whole Stevie makes poor choices when it comes to men trope was already a tiring one in the first seaso and I don't know why they continue to push things in that direction. Then again pretty much all of the kids don't have much of a compelling story for most of the season, which is quite the shame. I like how they all interact as a family but their individual arcs aren't always as great. There were some minor attempts to give more of a story to the other members of Elizabeth's staff but it's not something that was consistently explored. I know it's hard to do so as the ensemble is pretty big and it's hard to strike that balance along with the big political stories that really drive the show. But that's all part of the growing pains of a show like this. TL;DR: Madam Secretary continues to build on its success with this second season and the plot lines just get more and more complex. With more of a base to build on to tell greater stories, things just get deeper and deeper with this season. Thus it gets a great full 5 moments of Elizabeth comining up with great innovative solutions to big political problems out of a possible 5.